On the 10th of October, Labour MP Angela Smith published a defence of our privatised water industry in the Guardian. Here’s why she is wrong. Angela Smith is in the pocket of the water industry. She’s the chair of the All Party Parliamentary Group for Water, a group of MPs who monitor regulation of the water industry. This group is almost entirely funded by the water industry via a number of water companies, and the umbrella group Water UK. This cosy relationship means she’s utterly failed to get across some basic truths about the failures of privatisation. In bad-mouthing the idea of public ownership, Smith ignores best practice from around the world - in Scotland, Paris and the many hundreds of cities and communities that have taken control of their water. In Scotland, where bills are on average £42 a year lower than in England, publicly owned Scottish Water has successfully met EU and UK regulations on water quality, and no-one is calling them the ‘dirty man of europe’. The idea that public ownership in England would lead to pollution and environmental degradation is nothing but scaremongering. 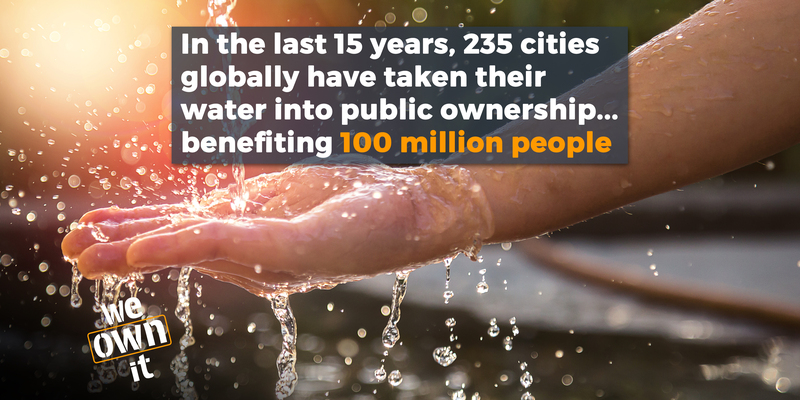 When water companies are public, they can make people and the planet their priorities, rather than shareholders. Scottish Water now invests so much in renewable energy generation that it generates twice as much electricity as it consumes. They’ve also launched a campaign to get people to ‘Top up from the tap’ instead of buying bottled water, to reduce plastic waste. Across the channel in Paris is another success story for public ownership of water - they’ve introduced sparkling water fountains all over the city, and have made reducing bills and improving water quality a priority. By contrast, England is unique in the world for having a fully privatised water and sewage industry. Researchers for the New Policy Institute have politely described the way our water industry is organised as 'very odd'. While the rest of the world is swept by a wave of 'remunicipalisation' - communities taking back control of their water from private hands - we're stuck in the past with an industry that doesn't work. Smith defends an outdated model where we rely on companies that are motivated by profit for shareholders, whose track record includes increasing our bills by 40%, dodging tax and paying their CEOs millions in pay and bonuses. People and the environment come last in this equation, thought of as collateral damage in the quest for higher profits. Environmental standards have indeed improved since the 1980s, but as Smith admits in her article, this improvement was initiated by government through the EU, and partly subsidised by government through the green dowry given to the private companies in 1989. It is incredibly naive to think that private companies would have made these improvements if they hadn’t been legally obligated to do so. The EU’s Drinking Water Quality Directive and Bathing Water Directive are the reasons that the Thames is cleaner than it has been in years, and that the vast majority of our beaches are far cleaner than they were in the 80s. Privatised water companies have shown repeatedly just how little they care about our rivers and countryside. They barely meet Ofwat targets, preferring to under-invest and pay fines when things go wrong. That’s why stories about dead fish, raw sewage in rivers and endless leaks are commonplace. Comparing today with the 80s, while ignoring changes in regulation and technology, is misleading at best. Water companies pre-privatisation did struggle for funding, because they had inherited billions of pounds worth of debt from the previous model, not to mention an outdated Victorian infrastructure, and they had to operate within very restricted financial boundaries. Margaret Thatcher’s government made their job very difficult, and then used their performance as an excuse to privatise. They never stood a chance. But public ownership of water is not about going back to the 80s - it’s about going forward to a new model - one that can't be sabotaged by future pro-privatisation governments. We do indeed need to make sure that water doesn’t compete with schools and hospitals for government funding. We can do this by having regional, publicly owned companies which can keep and invest the revenue they receive from bills. They should be financially independent from the government, and continue to make a profit (all of which would be reinvested in the service). Water is a profitable industry and it’s not rocket science to reinvest that profit for the public good, and the good of our environment. There is absolutely no need for water companies to compete for funds with other public services. 83% of us want public ownership of water. The privatised water industry has failed, and if the water companies want to help us create a better, greener and more democratic future, then they’d better get with the programme.